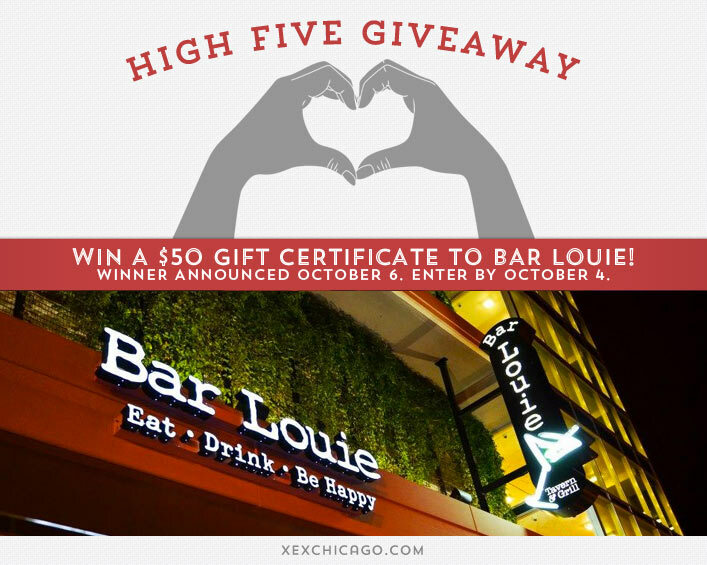 Win a $50 Gift Certificate to Bar Louie! Congratulations to AnnaLiese Quistgaard, William Draisey and Pan Selman on winning the three gift certificates we gave away to Wildfire in September! Bar Louie is an eclectic urban bar with warm surroundings, filled with nightlife photography, hand-laid tile artwork and other local architectural touches. Made famous for our handcrafted signature martinis, we also feature an exceptional selection of uniquely presented American food traditionally and regionally inspired, including small plates, burgers and sandwiches. While beer and wine connoisseurs will be impressed with our extensive selection of imports, microbrews and over 20 wines by the glass, cocktail drinkers will revel in signature martinis, mojitos and margaritas made from the highest quality ingredients, fresh fruit and hand squeezed juices. Bar Louie has multiple locations, with one at 333-335 N Dearborn Street, Chicago. Visit their website or call them at 312-863-2363 for more information. How long are most shampoos good for? Now, just add a comment to this post with the right answer to be eligible to win! The winner will be announced on Monday, October 6. Entries must be received by midnight on Saturday, October 4. Good luck! 2-3 years if it lasts that long! !